On the 20th of September, in the premises of Leopold Hotel in Brussels, the European Conference on Environmental Management in Laboratories took place. This Final Conference was hosted by EUROLAB, the European Federation of National Associations of Measurement, Testing and Analytical Laboratories, one of the partners of the Erasmus+ ECVET-Lab Project. ECVET-LAB Project (Erasmus+) aims to contribute to the implementation and validation of the non-formal training on environmental best practices for environmental testing laboratory technicians. Specifically, by applying methodologies and practices that conserve natural resources, improves the resources efficiency and protects those working in laboratories from chemical or biological risks. 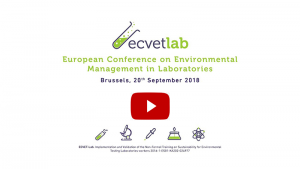 In this conference, ECVET-Lab project partners presented some of the main outcomes of the project: identified best environmental management practices in European labs, a new Qualification Standard of environmental management competence for laboratory technicians and a free Online Training Course for obtaining this innovative qualification. Several laboratories contributed to the conference with their practices and experiences in the field. IPROMA, from Spain, Nireas International Water Research Centre, from Cyprus, and Çevre Industrial Analysis Laboratory, from Turkey, shared their daily environmental management systems. They all agreed that the project will be a useful tool both for the educational system and the private sector. Indeed, some of these participated in different focus groups during the project and provided their environmental experience. The panel discussion was composed of high-level representatives from each field, including representatives of laboratories’ organisation, such as Álvaro Silva Ribeiro, EUROLAB President; Bern Kroon, President of Fenelab and Ömer Güzel, Honorary President of TURKLAB. In the field specialized in laboratories, from the private sector Nuria Font: Responsible of Volatile organic compounds (IPROMA) and Andreas Schmidt, professor and testing engineer from TGM VA-KU also participated in the debate. Special attention should be paid to some of the claims that the panellists made. Álvaro Ribeiro, , assured that “This project adapts the expectations of the new generations along with the new upcoming approaches. It should not be the end of a project, but the beginning” highlighting the opportunities that ECVET-Lab can give. Nuria Font also added that “This best practices guide will make our work easier although a deeper and further approach could even improve environmental issues at workplace”. Some of the attendants and panellists believed this project should not stop here.